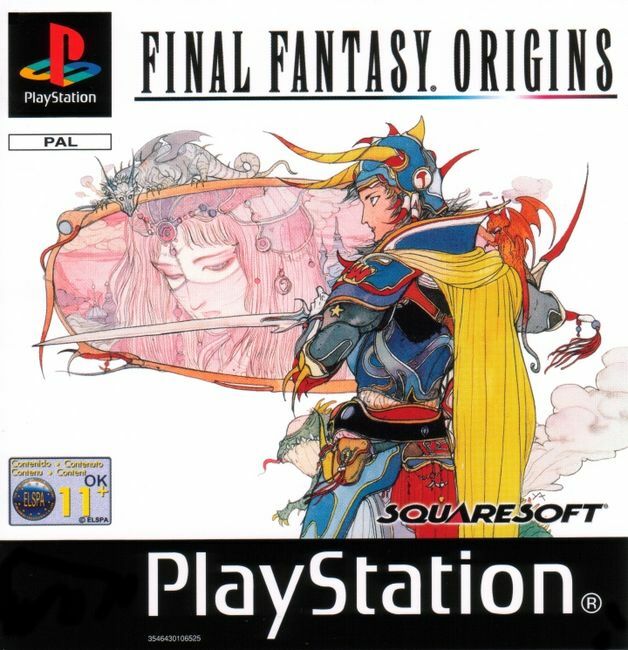 Just to be clear, this is the review for Final Fantasy 1 as it appears on the Final Fantasy Origins re-release. Not the original NES version. 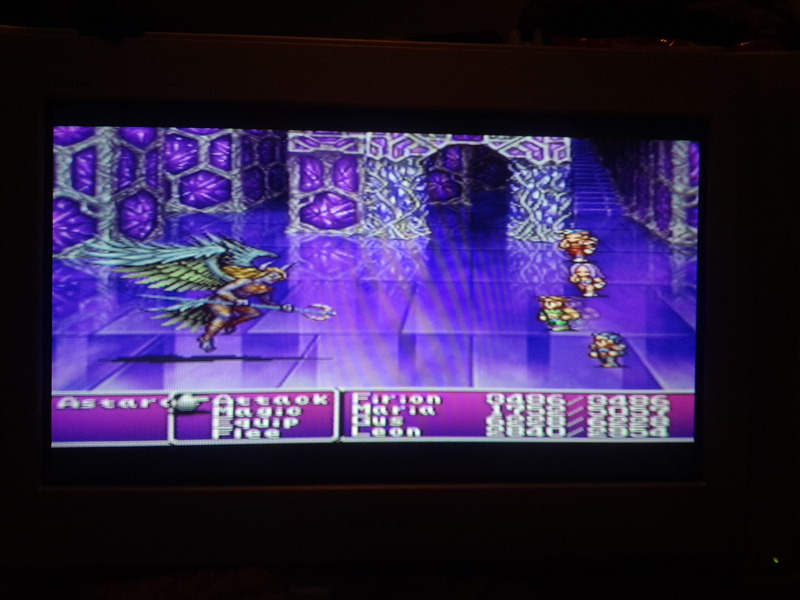 I had originally intended to do a Final Fantasy a week until they were all done, but it has taken me just over a month to do Final Fantasy 2. Items no longer stack, so 2 potions take 2 spaces. You can carry 63 items, instead of 30 (original to origins difference). The levelling system is utterly unique! Not as many decent (epic) boss fights. Differences between NES and Origins battle screen. The evil Emperor summons the demons of hell, and *ahem* all hell breaks loose… At the start, your party is shown escaping Fynn, but you’re caught by the hard dudes pictured above. You instantly lose the fight, and Leon goes missing. 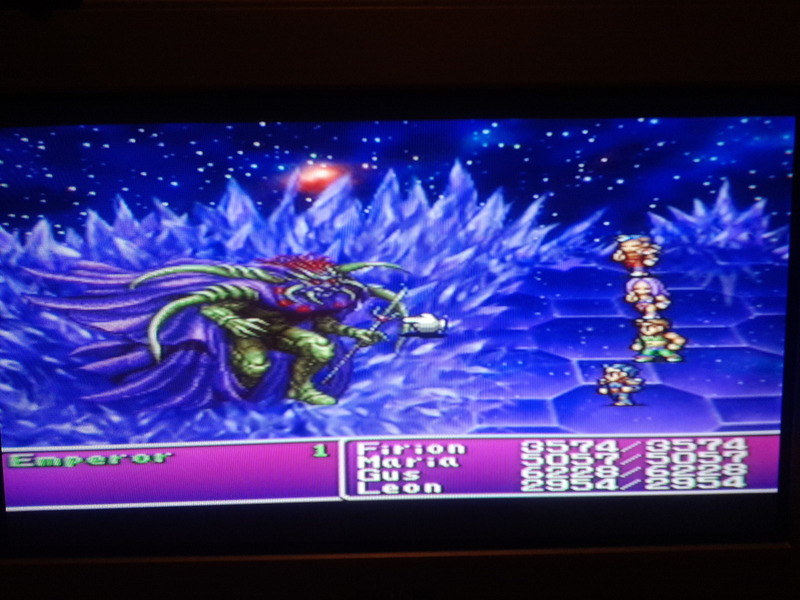 For the rest of the game, Firion, Maria, and Gus go in search of Leon, join the Rebel Alliance, and eventually defeat the Emperor. There is a twist in the story, as there always is in Final Fantasy, and I won’t ruin it, but it isn’t as stupid a twist other Final Fantasy games. Throughout your search for Leon, you’re joined by other people, who vary in their usefulness. Well, when you win a fight you don’t get “X” EXP. You get EXP for what you did. Cast a spell, your Magic will go up. Cast a lot of spells, your Mana goes up. Physical attack, your strength goes up. take damage, your health goes up. However, stats counteract others, so increasing your strength decreases your mana. This means you can’t just cheat, and hold down x. There is a “memory mode” which allows you to tell the game which moves to do, but that is cheating, so I didn’t do it. All in all, it is a very interesting system, I would actually have liked to see this leveling model in subsequent Final Fantasy games (apparently it was in FF14), but with some improvements. The first decent boss fight just so happens to be the seconds to last fight. Firstly, Magic. Take Cure as an example. You cast it once, you gain 1 point in Cure. To level Cure to Cure 2, you need 100 points in Cure. To get to Cure 3, you need 100 points in Cure 2. So it is a very simple system. It is just a chore. 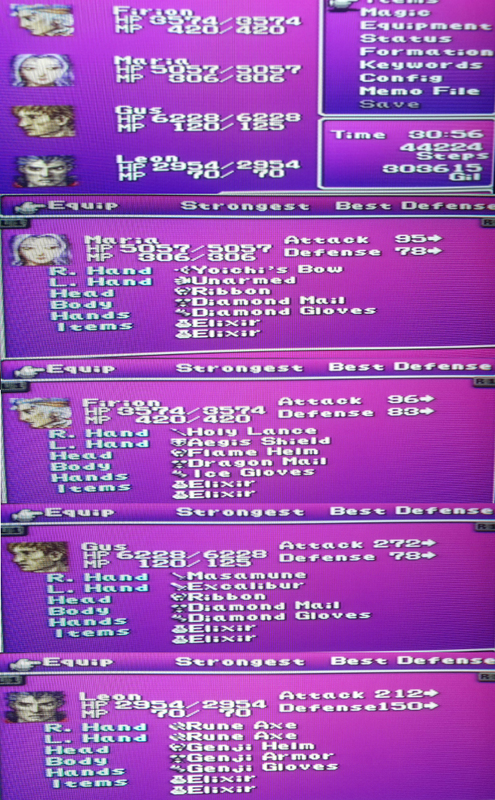 In my party I went for a black and a white mage, 2 warriors. But I wanted both mages to be good healers, as there are several standard mobs that’ll insta-kill you. So I needed the other to heal or resurrect in a bind. Firion had Cure, Life, Shield, Fire, Ice, and eventually Flare. Gus had Cure, Shell, Shield, Blink. By the time you get Flare and Ultima, your Fire/Bolt spells will have leveled significantly (mine were 8/9), but despite Flare/Ultima being the ULTIMAte magic Ultima 1 is equivalent to Fire 2. So at the end, you can either power level Flare/Ultima, or persist with Fire/Bolt (Don’t do this… Final Boss is only susceptible to Flare/Ultima/Holy). What this means is that when you get to the Jade Passage, you have to grind. Lots, and lots of lovely grind. You need to level your shield/blink/shell spells, as without these most bosses will kill you in one. Esuna only heals things at certain levels, so Stone/Frog/Banish type ailments require Esuna level 5 plus. Poison is level 1. Having 3 heals is good for quick recovery. All of this means there is no auto-pilot, you have to concentrate. But it also means the most effective way to level is to beat on yourselves. I would have Gus physically attack the group, while, Firion and Maria cast an assortment of spells. In later levels, once I got Osmose, I would get Maria to steal all the parties Mana so they would level that quicker, for the final passage. At the start, leveling is slow, but once you get Gus doing 2000 damage you start to level exponentially. I stopped leveling around 5000 hp, but it took 20 hours fight time to get to 2000 hp, and then a further 10 hours to get to 5000. Fixing those two issues would have made the leveling system perfect. Your main party is Firion, Maria, and Gus. Leon is lost at the start of the game, and you don’t get him back until VERY late in the game. In the mean time, you get random characters, who due to you knowing they are temporary, you just don’t care about. The 4th character join you for a dungeon or two, and as a result, you stop caring about them. Some come back later, but unless you know the game, you don’t know when they’re back. It also means you can lose decent weapons, as they keep what you equip. For the first 20 hours of the game you have ZERO gil, so it is an inconvenience you could do without. 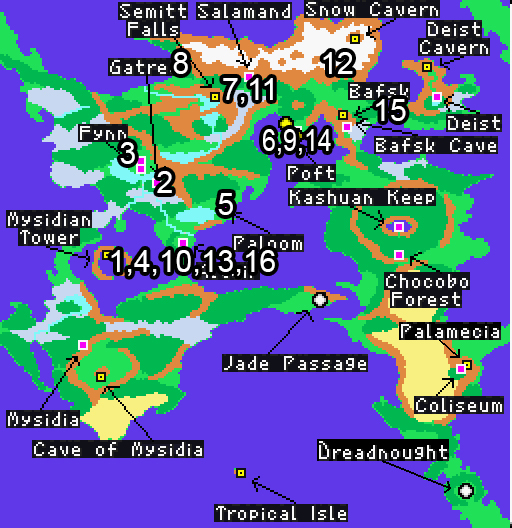 The overworld is much bigger now, however there are less towns, and the towns are kinda similar. In FF1 there was a Dwarf town, a mine town, an Elf town. In FF2 there are just normal towns, all with similar layouts and themes, it is a little boring. Travelling the world is a bit of a chore too, until you get the ship (or even airship) it is a case of running backwards and forwards across pretty much the whole map. This isn’t 100% accurate, but from memory, this is basically the route you need to go, and handing in the quest isn’t obvious. But ultimately, every quest requires you to go back to Altair. To give you an idea of scale, going from Altair (where 1 is) to Poft, this is 2 minutes of walking on the overworld, not including fighting. Salamand to the Snow Cave is 5 minutes, again without fights. So while this map looks like there is a lot, there isn’t. Unlike FF1, resurecting is no longer an issue. You gain “Life” very early on, but you also get Pheonix downs. This makes dungeon running much simpler! The music here is alright. I didn’t notice a lot of it while playing, but the Rebel Theme is nice, the Final Fantasy Prelude is slightly expanded on the FF1 version, and the Town Theme is very calming. Have a listen here, it is Nobuo Uematso so you’ll know what to expect. YouTube Link. I actually don’t like the graphics here. The Sprites are a higher resolution, and have more detail, but they are smaller and less “standoutish”. 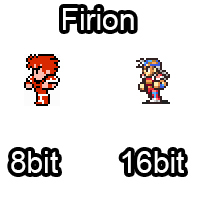 The eagle-eyed amongst you may notice Firion is the same Sprite as the Warrior from Final Fantasy 1. 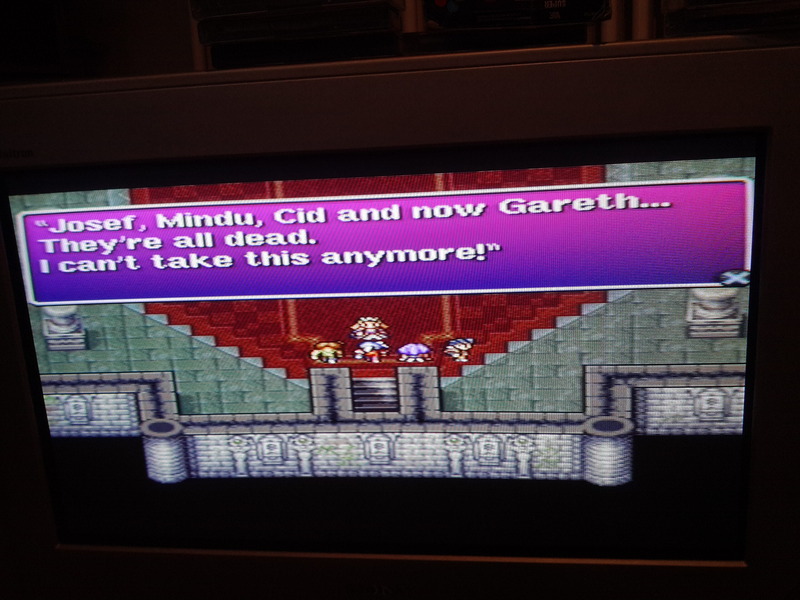 Overall FF2 is a good game, it is a solid sequel, which improves on the first in many ways. My main issue is it takes 20 hours to really get going and the first 3/4 of the game are a bit of a chore, if you stick it out it pays off, but getting through the first section really is a challenge. I haven’t played the originals. First FF game I played was 7.